With a variety of driver friendly features, versatile seating and cargo configurations as well as fuel efficiency, more car shoppers are exploring the SUV automotive segment. New SUV shoppers will find a wide range of choices from almost every auto manufacturer. With so many options it can be difficult to decide which of these models is right for you. To help with your research, we have put together the following comparison between two of the most popular new models, the 2019 Ford Edge and the 2019 Jeep Grand Cherokee. Pricing for new SUVs is almost as diverse as the multitude of models on the market today. Low end, lesser quality SUVs have a base MSRP around $18,000 and high end, luxury brands start around $45,000. Both the new Ford Edge and the Jeep Grand Cherokee fall in the middle of this wide price span. The 2019 Ford Edge starts around $30,000 and the 2019 Jeep Grand Cherokee is offered at around $33,000. Cost factors for these vehicles include typical maintenance expenses. Over the duration of vehicle ownership the Ford Edge will cost less to maintain and repair. Ford parts are less expensive than Jeep parts so typical repairs cost much less on the Edge than the Grand Cherokee, including $8 less for a muffler, $4 less for front brake pads, $297 less for a starter and $70 less for a fuel pump. 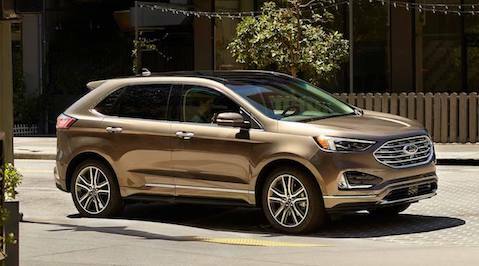 The new Ford Edge and new Jeep Grand Cherokee both offer good fuel economy but the new Ford Edge gets better fuel mileage. The Ford Edge 2-Wheel Drive 2.0 turbo 4 cyl./8-spd model has been rated with an mpg of 22 city/29 hwy. The Jeep Grand Cherokee 2-Wheel Drive 3.6 V6 model has been rated with a mpg of 19 city/26 hwy. 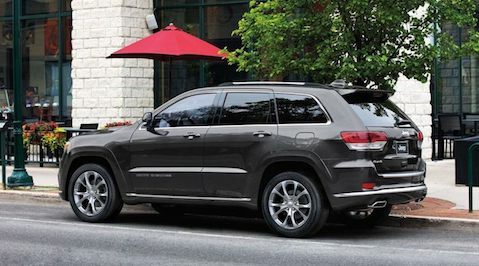 Both the Edge and the Grand Cherokee are well equipped with front and side airbags, four-wheel antilock brakes, traction control and electronic stability systems. Although similar some differences do exist between these two SUVs. The Edge is offered with inflatable rear seatbelts that limit head and neck movement during a collision to help prevent spinal and internal injuries. The Grand Cherokee is not available with inflatable seatbelts. The Edge is also equipped with Post Collision Braking, which automatically applies the brakes after a crash to help prevent secondary collisions. The Grand Cherokee doesn’t offer a post collision braking system. The Ford Edge offers more passenger and cargo space than the Jeep Grand Cherokee. The Edge has 8.5 cubic feet more passenger volume, .3 inches more front headroom, 2.3 inches more front legroom, 1.6 inches more front shoulder room, 1.1 inches more rear headroom, 2 inches more rear legroom, 1.3 inches more rear hip room and 2.5 inches more rear shoulder room than the Grand Cherokee. Cargo space is also more abundant in the Edge. With the rear seats up the cargo area of the Ford Edge is 39.2 cubic feet compared to 36.3 cubic feet of cargo space in the Grand Cherokee. When the rear seats are down the Edge offers 73.4 cubic feet of cargo space vs. 68.3 cubic feet of space in the Grand Cherokee. The bottom line between these two SUVs is that the Ford Edge offers more of what SUV shoppers are looking for. The Edge has a better price, better fuel efficiency, and more safety features as well as more passenger and cargo space. Why not stop by our Ford dealership to learn more about this exceptional new SUV?